OUT WITH THE WIZARDS, LIZARDS, AND BROADS… IN WITH THE CHICKENS AND ZAPATISTAS!!! 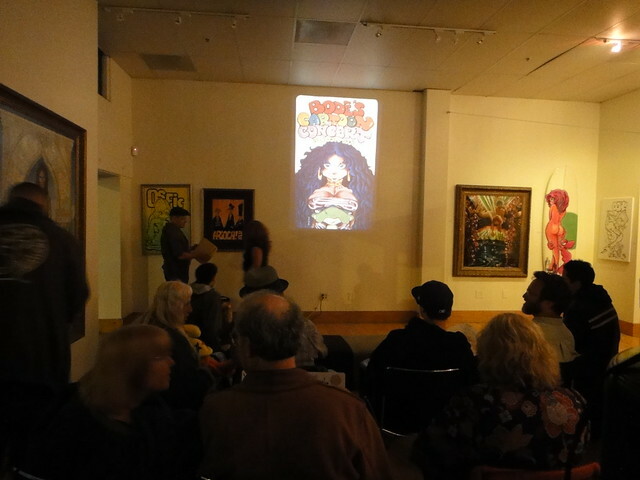 We bid adieu to Mark Bode’s “Wizards, Lizards, and Broads” last Friday in the best possible manner… with lots of laughs, smiles, and admiration for the legacy the Bode family has created. Bode’s Cartoon Concert Series was f’in HILARIOUS! We never knew that Mark was quite the performer… or had so many voices… Make sure that if it is playing near you that you do not skip out on it. We swear you will have a roaring good time. 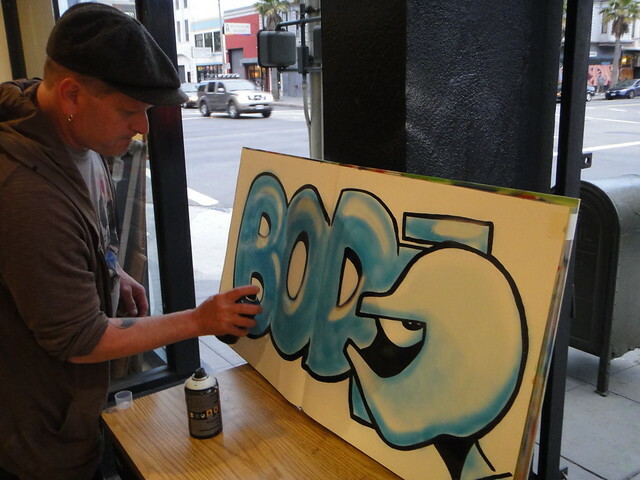 Mark Bode makin' his presence known in 1:AM's black book. Thank you, Mark for all the laughs and hard work. You are one of the best artists we have ever worked with. We have been honored and humbled. Make sure you check out Mark’s next event at Medicine Agency on August 27th, for his TOTT Global Puzzle release party! … IN WITH THE CHICKENS AND ZAPATISTAS!!! Make sure you join us this Saturday, August 7th for the opening of “The Revolutionaries” featuring new works by Cache, EyeOne and friends. We are flippin’ it on you and having a DAYTIME opening, be here 12-6:30pm! Mark your calendars! See you here! « WE ARE IN SFBG’S BEST OF THE BAY 2010!! !